Xavian Tate calls himself “the Future Dr. Tate.” He is confident—and rightly so. The sophomore biomedical sciences major (pictured above), who is planning a career as a clinician, also studies Spanish and K-12 education for science/technology/engineering/math. In his free time, he writes songs and poetry. But a couple of years ago, Tate arrived on campus from Anniston, Alabama, feeling shy and uncertain. The BMEN (Blazer Male Excellence Network) peer mentoring program encouraged him to open up and make connections that are helping him realize his dreams, he says. “With BMEN, I had the best freshman experience ever,” Tate explains. “My mentor helped me become who I am toward other people. BMEN shaped me.” Now Tate is paying forward that positive experience with newer students. The mentee has become the mentor—the 2018 BMEN Mentor of the Year, in fact. At Birmingham's Robert Hill Custom Tailors, Xavian Tate gets lessons on looking sharp from fashion consultant Marvin Harrell Jr.
Trevor Stewart meets with mentor Jeremy Blackmon at Hill Student Center. A BMEN pin provides a finishing touch for a professional outfit. Consultant Tavaris Handley adjusts the signature BMEN bow tie worn by Booker Taylor III. 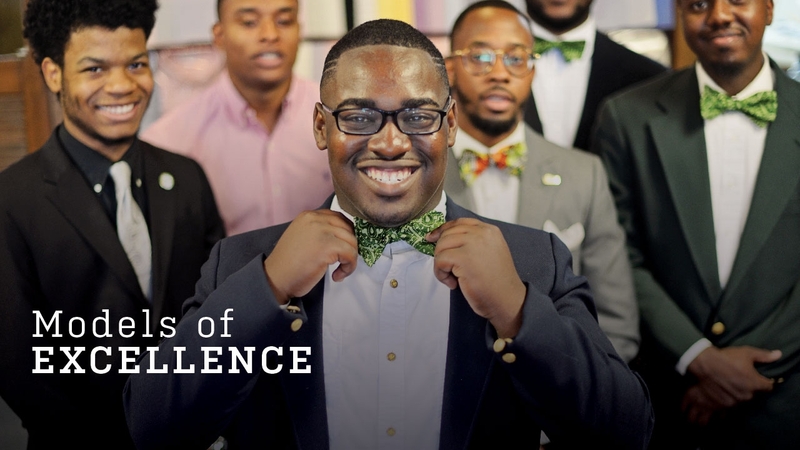 BMEN awards its prestigious Green Blazer to members demonstrating exceptional leadership in the classroom, on campus, and in the community. This year’s honor went to Oladele Osisami and Bobby Ijeoma of the UAB Honors College. The London, England-born Osisami, who has lived in the United States since he was a child, majored in biology and worked as a nursing research assistant. Ijeoma, a son of Nigerian immigrants, is a native of Marietta, Georgia, who majored in chemistry and was in UAB’s Early Medical School Acceptance Program. Both men, who graduated this spring, plan to attend medical school. • Learn more about BMEN and other opportunities from UAB Student and Multicultural Diversity Programs.